Wedged between the Atlantic coast and the Kalahri Desert, Namibia is one of Africa’s hidden gems that is slowly emerging as a popular tourist destination, with safaris in Namibia high on the to do list. A sense of freedom is generated by an epic, empty landscape with wide horizons, unpolluted skies and one of the world’s lowest population densities. These facts, combined with a plethora of large game animals and a frontier feel make Namibia the ultimate photography or self-drive safari destination, and too bad either if you’re looking for an indulgent luxury safari experience. The Namib Desert is the world’s oldest desert, and a predominant feature of the country, extending all the way up the Atlantic coast on the western side of the country. The desert is scored by a number of rivers coming down from the Central Plateau – most of which are now permanently dry, or only flow during the rainy summer months. The north of Namibia is dominated by the huge, permanently flowing rivers of the Kuene, Kavango land Zambezi, which make up the borders with Angola, Botswana and Zambia respectivley. This part of the country is lush and green with dense woodlands most of the year, and home to several small national parks that teem with wildlife and birdlife. The rest of the country is made up of scrubby bush land of the higher Central Plateau, trailing off into the Kalahri desert in the east. Wildlife in Namibia is varied, and taking a safari in Namibia will allow you the opportunity to see all of Southern Africa’s mammals. As well as the big five, the Namib Desert is home to the exceptional and endemic desert-adapted elephant and rhino. In the Namib Desert and elsewhere in Namibia a truly extraordinary fact is that the country has one of the densest congregations of animals in the world, combined with one of the sparsest human populations, making for fantastic wildlife viewing. Unlike much of the rest of Africa habitat destruction is not generally an issue in Namibia, and you can expect to see large mammals roaming the wilderness as you drive between Namibian national parks or towns. This means you need to be ready for a safari experience in Namibia at any time you’re not in a town! Discover the sand dunes of Sossusvlei with a pre-dawn game drive and hike to top of a dune to watch the sun rise over the Namib desert. Take a self-drive safari tour around accessible but wild Etosha National Park – widely regarded as one of the world’s premier national parks. Visit the jaw-dropping 100km long, 26km wide Fish River Canyon in the Ai-Ais/Richtersveld Transfrontier Park – the world’s second largest canyon after the Grand Canyon in the US. As with the rest of Southern Africa, Namibia experiences summer between November and March and winter from May to August. From August temperatures keep rising until October when the first rains start to arrive in the northern areas, followed by large amounts of rain and occasional flash-flooding. The best time to go on safari in Namibia depends on where you’re going, and what you’d like to see. October to March is the best time to visit Namibia’s coast around Walvis Bay and Sossusvleias as the climate provides a pleasant respite from the heated interior. If you’re travelling through the Skeleton Coast region the climate is similar year round, with regular mist and winds. For the inland areas of Namibia – including the Namib desert, Etosha and Kavango regions, the cooler months from April September provide temperatures far more bearable than summer months. Between May and September thirsty animals gather at diminishing waterholes, making it the best time to go to Etosha for game viewing. Much like it’s neighbor Botswana, Namibia doesn’t see huge tourist numbers and has a focus on either low-impact, high-end safaris, or self-drive safaris. Safari accommodation on offer in Namibia reflects this, with a broad range of high-end safari lodges around the national parks, and excellent camping facilities for self-drivers attached to most safari lodges. If you want accommodation in a national park, this must be booked in person or by phone with Namibia Wildlife Resorts, who take care of all of Namibia’s national parks. With a fairly well developed regional and international inbound tourist market, Namibia has lots of wildlife activities and safaris on offer. These are supported and promoted by a broad range of safari tour targeting budgets of all sizes and trips of all lengths – from half days trips from the capital Windhoek to two or four week driving expeditions. 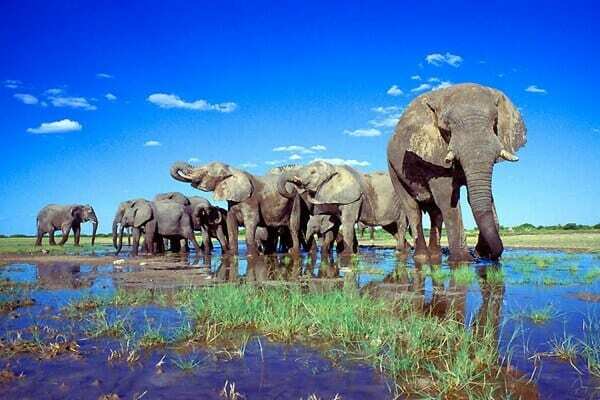 Check out our reviews of safari tour companies in Namibia. Have you been on safari in Namibia? We’d love to hear your thoughts or suggestions! Please get involved in the comments below.